Winter. I love its blue sky bright with snow-light. The crunching of spikes on ice. And all the slow-simmered and baked goods of winter. There's nothing more rewarding than coming in from a cold, long ski or toe-numbing hike and digging into an abundant table filled with warming comfort foods. One of the best après-ski dishes has to be the Swiss raclette, both the name of the cheese and the beloved dish. 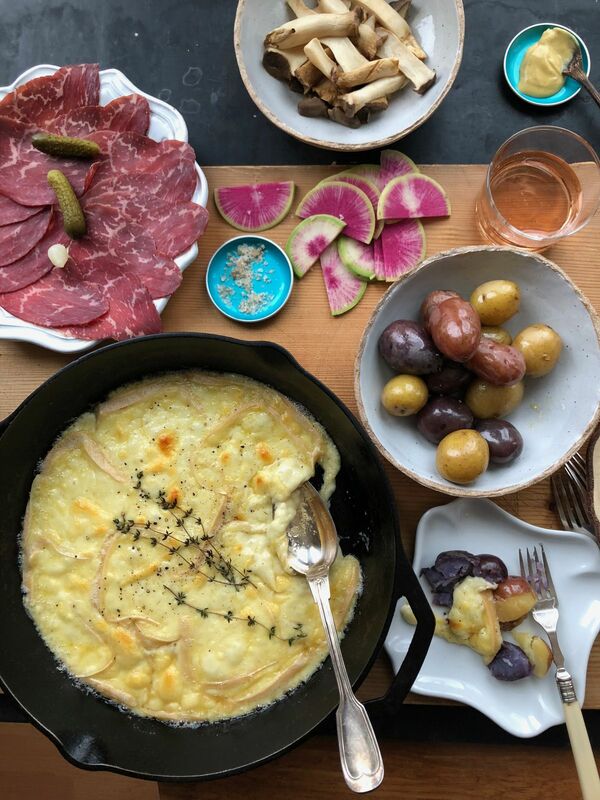 Raclette, from the verb racler (to scrape), is cheese that's melted and served with steamed potatoes and pickled vegetables. As early as the 12th century, raclette was enjoyed by Swiss shepherds, who would take a wedge of the cheese and pass the cut side over a flame to burn the top layer, which was scraped off and enjoyed before torching the next layer, etc. I love this dish for many reasons. It's so easy to prepare. Whether for an intimate dinner for two or for a larger group, it's deeply satisfying and can accommodate all manner of tastes. Hot cooked potatoes and some sort of cured meats are traditional, but why not include some smoked salmon or oysters, roasted mushrooms and garlic, crisp radishes and a fresh green salad? If you can't find raclette cheese — in Alaska, some Fred Meyer stores carry it in the Murray's cheese section; or try Fromaggio's in Anchorage, which carries three types of raclette and ships within the state of Alaska — opt for a good melting cheese, like provolone or fontina. As for what to drink with raclette, go for something like a sour ale or dry riesling; something to cut the richness. 1. Slice raclette into 1/3-inch thick slices and fan out, overlapping slices as needed, in a large cast-iron skillet. Add any herbs, such as fresh thyme or oregano, if using. If you have a raclette grill, slice cheese and place on a platter. Boil potatoes in a pot of lightly salted water for about 15 minutes or until tender when pierced with a sharp knife point; drain and allow to cool slightly. Gather all your meats and other accompaniments and place on serving platters. 2. Heat a raclette grill per manufacturer's instructions. Or, heat oven to broil Hi and broil raclette until cheese is bubbling and golden on top. Smash some of the potatoes with a fork and pour the melted cheese over. Enjoy with the other accompaniments.